When last we left the rogue group of heroes who’d set out to fetch a White Walker, Jon Snow, Jorah Mormont, Gendry, Tormond Giantsbane, Thoros of Myr, Beric Dondarrion and The Hound had just begun their cold journey together; as we returned this week to their frigid trip, we couldn’t have imagined the hour’s events. Before things went truly unhinged, viewers were treated to a few asides, the high being a continuing conversation between two of our favorite ornery characters, Tormund and Sandor Clegane. 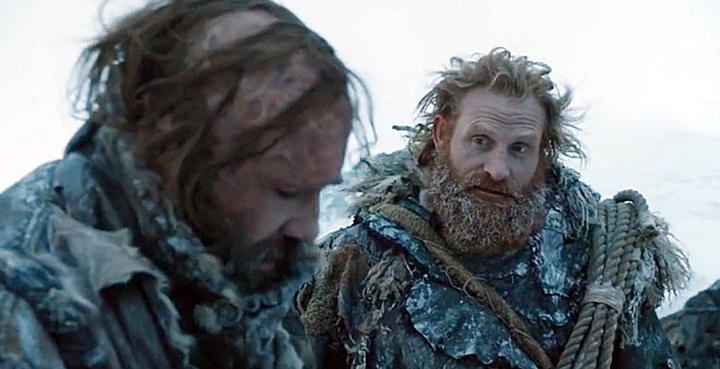 With that ever-present twinkle in Kristofer Hivju’s eye, Giantsbane set about getting to know his fellow traveler, and like it or not, the (almost) humorless Hound (played to maximum delight by Rory McCann) found himself unable to escape a friendly chat that ran the gamut from genital slang to Tormund’s greatest desire … It was one of the most glorious conversations in Game of Thrones‘ history. 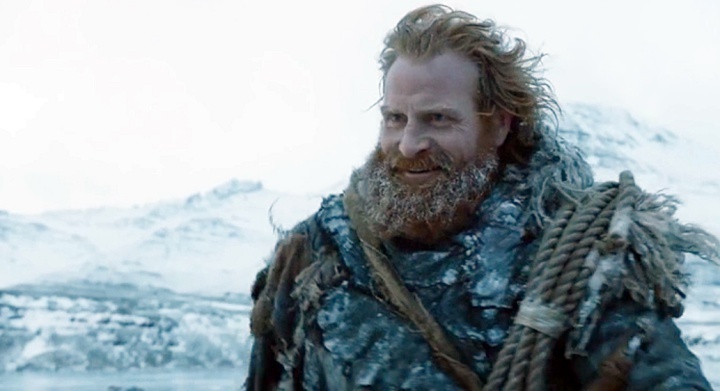 Nevertheless, Tormund persisted … and learned a little about the Hound’s dark past. … letting Tormund in on a term he’s never heard before; the Hound explains. Our favorite ginger then explains his heart (and other parts) belong(s) to A VERY SPECIAL SOMEONE. The Hound has an idea as well. Then comes the crowning glory of Tormund’s admissions, his true intentions toward Lady Brienne. The Hound can’t quite believe his ears, or make sense of his new comrade. Now, hurry up and get back to Brienne, sweet gingerbeard; we all want those babies as much as you do.